Full Time, Shift Starts Daily at 5:30 AM (Tuesday - Saturday, closed Sunday and Monday). This position is for the Main Smyrna Store. Job Description This position involves decorating a variety of cake styles with buttercream icing including: Birthday, Shower, Specialty Shaped, Wedding Cakes, and other assorted special occasion cakes. Cake decorator is responsible for filling cake orders in a timely fashion, some customer consultation, ordering and inventory management of cake and decorating supplies. All employees must be willing to help with any tasks throughout the bakery, including cleaning, packaging, etc. We are a TEAM and we are looking for TEAMMATES who will pitch in and take care of whatever needs to be done. Requirements Ability to work quickly through multiple tasks, remain attentive to production schedules, proactive approach to equipment setup and preparation. Experience with rolled fondant icing is preferred. Extensive experience in cake decorating with buttercream icing is a requirement. Please bring or email any photographs of past cakes you have decorated. Email pictures to ryan@mcentyresbakery.com. Please put your name and "Application Photos" in the subject line. 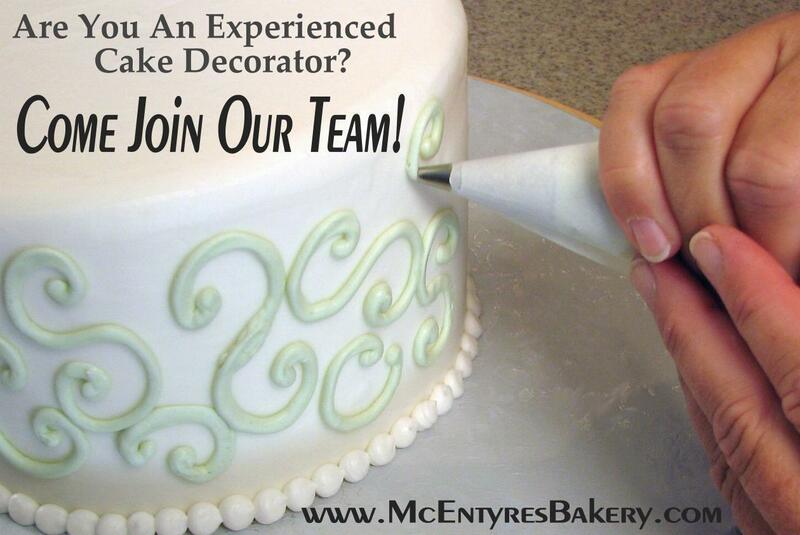 Actual cake decorating will be part of the interview process. This position requires lifting, long periods of standing (hours), lots of walking, and the ability to "hold it together" under pressure. It is physically demanding, please do not apply if you cannot work the days/hours listed above or if you cannot physically perform the tasks required to carry out the position.